Leukocyte recruitment to the airway lumen is a central feature of inflammatory conditions such as asthma and respiratory viral infection. Characterization of mediators that regulate leukocyte recruitment in these conditions revealed increased IL-12 p40 homodimer (p80) levels were associated with enhanced airway macrophage accumulation. To examine this association, we used in vivo and in vitro assays to demonstrate p80, but not IL-12 or p40, provided a macrophage chemoattractant signal. Macrophages from genetically deficient mice indicated p80-dependent chemotaxis was independent of IL-12 and required IL-12Rβ1 (Rβ1) expression. Furthermore, analysis of murine cell lines and primary culture macrophages revealed Rβ1 expression, with an intact cytoplasmic tail, was necessary and sufficient to mediate p80-dependent chemotaxis. To examine the role for Rβ1 in mediating macrophage accumulation in vivo, we contrasted Sendai virus-driven airway inflammation in wild-type and Rβ1-deficient mice. Despite similar viral burden and production of the macrophage chemoattractant p80, the Rβ1-deficient mice displayed a selective decrease in airway macrophage accumulation and resistance to viral-dependent mortality. Thus, Rβ1 mediates p80-dependent macrophage chemotaxis and inhibition of the p80-Rβ1 interaction may provide a novel anti-inflammatory strategy to manipulate the inflammation associated with asthma and respiratory viral infection. An inflammatory response consists of a coordinated series of cellular and molecular events that culminates in the accumulation of leukocytes. The precise regulation of this leukocyte accumulation is critical in maintaining host defense. Abnormal regulation resulting in a compromised inflammatory response can allow for an overwhelming microbial infection, whereas an enhanced response can produce pathophysiologic abnormalities with detrimental consequences. In the particular context of airway inflammation, responses directed toward infectious agents are essential for microbial containment and clearance from the airway (1, 2). However, certain respiratory diseases such as asthma are characterized by the excessive accumulation of immune cells in the airway (1, 3, 4). Characterizing the cellular and molecular mechanisms that regulate leukocyte accumulation is critical for developing anti-inflammatory agents that will preserve appropriate inflammation to invading pathogens and prevent inappropriate pathophysiologic inflammation. The accumulation of tissue leukocytes, including macrophages, is a central component of an inflammatory response. In general, this accumulation is the sum of leukocyte influx, retention, and efflux from the inflamed tissue compartment. Leukocyte influx from the blood vessels to the inflamed tissue is directional and when occurring toward a chemoattractant gradient is referred to as chemotaxis. Experimental evidence now supports a multistep chemotactic paradigm for leukocytes involving chemoattractant engagement with a cell surface receptor, activation of intracellular signaling cascades, and differential polymerization of filamentous actin (F-actin)3 at the leading edge. This polarized change of actin within the cell produces spatially regulated protrusions of the cell membrane (i.e., lamellipodia and filopodia) that culminate in forward movement (5, 6, 7). Given that chemotaxis is central to leukocyte accumulation during appropriate inflammation, we hypothesized that disease conditions with enhanced leukocyte accumulation would be associated with elevated concentrations of chemoattractants. In the course of examining human subjects with asthma and mice following respiratory viral infection, we observed that these inflammatory conditions were associated with exaggerated expression of IL-12 p40 homodimer (p80). Furthermore, there was a positive correlation between p80 concentrations and macrophage accumulation in the airways (1). p80 belongs to a family of IL-12-related cytokines that possess shared as well as distinct biologic properties. The IL-12-related cytokines consists of glycoproteins encoded by five independently regulated genes: p40, p35, EBV-induced gene 3 (EBI3), p19, and p28 (8, 9, 10, 11, 12, 13, 14, 15). Due to alternative heterodimeric partnering and monomer secretion, this family includes seven secreted proteins: IL-12 (a p40 and p35 heterodimer), p80 (a p40 homodimer), p40 (a p40 monomer), EBI3, EBI3/p35 (an EBI3 and p35 heterodimer), IL-23 (a p40 and p19 heterodimer), and IL-27 (a p28 and EBI3 heterodimer). Since IL-12 and p80 share the p40 subunit and both proteins can be simultaneously secreted, ascribing specific biologic properties to IL-12 or p80 has been challenging. With this in mind, previous observations indicated that p80 interacts with IL-12Rβ1 (Rβ1) to act as a competitive antagonist of IL-12 and increase macrophage movement (1, 10, 11, 16, 17, 18). Additional studies using in vivo p40 overexpression models have suggested p80 can function as a proinflammatory protein that can enhance leukocyte (including macrophage) accumulation in the skin, blunt Th1 immunity to Plasmodium berghei, and provide protective immunity toward mycobacterial infection (19, 20, 21, 22). Collectively, these data along with our previous observations suggest that p80 may possess unique immunomodulatory properties that could result in enhanced macrophage accumulation independent of IL-12. The present studies were initiated to identify p80-specific immunomodulatory properties that could explain the relationship between increased airway p80 concentrations and macrophage accumulation in asthma and respiratory viral inflammation. We demonstrated that p80, but not IL-12 or p40, resulted in macrophage chemotaxis that was independent of IL-12 and mediated through the cytoplasmic tail of Rβ1. Extending these findings to an in vivo inflammatory condition, Rβ1−/− mice displayed a selective decrease in macrophage accumulation in the airway and resistance to viral mortality. Taken together, these observations demonstrate that p80-dependent macrophage chemotaxis and respiratory viral inflammation are mediated through Rβ1 and identify these proteins as potential anti-inflammatory targets. C57BL/6J, BALB/CJ, BALB/cJ IL-12Rβ1−/−, BALB/cJ IL-12Rβ2−/−, and C57BL/6J IL-12 p35−/− were obtained from The Jackson Laboratory (Bar Harbor, ME). C57BL/6J IL-12 Rβ1−/− mice were a generous gift from D. Keith Bishop (University of Michigan, Ann Arbor, MI). Mice were maintained under pathogen-free conditions for study at 7–9 wk of age. Experimental manipulations were performed in a class II laminar flow hood. Sentinel mice and experimental control mice for Sendai viral (SeV) infection were handled identically to infected mice and exhibited no serologic or histologic evidence of exposure to 11 rodent pathogens (including SeV). The Washington University School of Medicine Animal Studies Committee approved all experimental protocols and procedures. As described previously, mice underwent i.p. injection with ketamine (80 mg/kg) and xylazine (16 mg/kg) followed by anterior neck dissection and intratracheal injection using a 29-gauge needle and microinjection syringe (Hamilton, Reno, NV) containing PBS (30 μl) without or with recombinant murine IL-12, p80, or p40 (40 μg/kg) (1). At 18 h after injection, the trachea was cannulated with a 22-gauge angiocatheter, and lungs were lavaged with 1 ml of PBS. Cell-free supernatant was collected and stored for cytokine analysis (when indicated) and cell pellet was lysed with ammonium chloride RBC lysis, then resuspended in 1 ml of PBS for total cell count, cytospin preparation, and Wright-Giemsa staining. Two independent observers determined immune cell differential using standard light microscopy criteria as described previously (1, 2). Mice underwent i.p. injection with 1.0 ml of sterile 3% w/v thioglycolate (Sigma-Aldrich, St. Louis, MO). Five days later, the peritoneal cavity was flushed with 10 ml of DMEM containing 0.01% BSA. Cells were washed once with medium and used for chemotaxis assay. Typical yield for all strains was 6–10 × 106 cells/animal and cell differential consisted of 98.3 ± 1.1% macrophages, 1.3 ± 0.8% neutrophils, and 0.5 ± 0.4% lymphocytes, mean ± SD (23). To harvest and differentiate BMM, the proximal and distal ends of humerus, femur, and tibia were severed and the bone marrow cavity was flushed with 5 ml of sterile PBS using a 25-gauge needle. Bone marrow cells were cultured overnight in α-MEM supplemented with 10% FCS and the following day nonadherent cells were incubated in medium with 100 ng/ml mouse M-CSF (a generous gift from S. Teitelbaum, Washington University School of Medicine, St. Louis, MO). The BMM cells express the macrophage surface markers CD11b, c-FMS, F4/80, and RANK and maintain morphologic features of macrophages by light microscopy (24, 25, 26). We used a modified Boyden chamber to assess chemotaxis according to recommended protocol (NeuroProbe, Gaithersburg, MD). Peritoneal macrophages, NIH3T3, or BMM (25,000 cells/well) were placed in the top compartment above a polycarbonate membrane containing 8.0-μm pores, and medium or chemoattractant was placed in the lower compartment. The entire apparatus was incubated at 37°C (2 h for peritoneal macrophages and BMM and 6 h for NIH3T3 cells), the membrane washed (top side only), methanol fixed, Wright-Geimsa stained, and mounted for viewing. For each well, cells located on the bottom side of the membrane (i.e., cells that have undergone chemotaxis through the membrane) were counted in five random fields chosen from the center and all four peripheral quadrants (magnification, ×400). Individual well values represent the mean of all five fields and experimental conditions were repeated in triplicate. Final results represent the mean of at least three independent experiments. rIL-12, p80 (R&D Systems, Minneapolis, MN), and p40 (BD Biosciences, San Jose, CA) were >95% pure and endotoxin levels were <1 ng/μg cytokine. We have confirmed high purity of rIL-12, p80, and p40 by Western blot analysis (1). In this assay, IL-12 and p80 remained intact following denaturization (100°C treatment for 5 min); therefore, these proteins likely do not dissociate to individual subunits during the in vitro chemotaxis assay. p80 contains two p40 subunits that are joined by an intermolecular disulfide bond. These bonds are formed by the intracellular enzyme protein disulfide isomerase; therefore, we anticipate extracellular p40 monomers do not spontaneously associate to form p80 during the in vitro chemotaxis assay. Since IL-12 failed to generate cell movement, we verified IL-12 biologic activity by demonstrating a concentration-dependent increase in splenocyte proliferation (data not shown) (27). Optimal concentrations of the known chemoattractants, recombinant mouse JE/CCL2 (JE, murine homologue to human monocyte chemoattractant protein-1; R & D Systems), fMLP (Sigma-Aldrich), and mouse epidermal growth factor (EGF; BD Biosciences), were determined using 10-fold serial dilutions ranging from 10−8 to 10−13 M. As described previously, NIH3T3 cells were placed in serum-free medium 16 h before initiation of chemotactic or F-actin assays (28). To perform checkerboard analysis, p80 was also placed in the upper compartment of the modified Boyden chamber. To selectively block p80 in the chemotactic medium, 200 μl of solution without or with p80 was incubated sequentially with goat IgG or anti-IL-12 p40 mAb (clone 30517, 1 μg/ml; R&D Systems) for 2 h at 4°C and then 15 μl of packed protein G-Sepharose beads for 2 h at 4°C. Following centrifugation at 13,000 × g for 15 min at 4°C (to pellet the protein G-Ab-p80 complex), supernatant was placed in the bottom compartment of the modified Boyden chamber. To selectively block Rβ1 on the peritoneal macrophage, cells were incubated with goat IgG or goat anti-human IL-12Rβ1 pAb with cross-reactivity to mice (catalogue no. AF839, 1 μg/ml; R&D Systems) for 15 min at 27°C, and the cells were then placed in the upper compartment of the modified Boyden chamber. To generate a retroviral construct expressing full-length Rβ1, the EcoRI-digested fragment of mouse IL-12Rβ1 (ATCC no. 87597; American Type Culture Collection, Manassas, VA) that contains the full-length Rβ1 cDNA was ligated to EcoRI-digested pMX-PURO to generate pMX-PURO-mIL-12β1. To coexpress Rβ1 and green fluorescent protein (GFP), pMX-PURO-mIL-12Rβ1 was BamHI/NotI digested to release Rβ1 and ligated into BamH I/NotI-digested pMX-IRES-GFP to generate pMX-mIL-12Rβ1-IRES-GFP. pMX-PURO and pMX-IRES-GFP were a generous gift from T. Kitamura (University of Tokyo, Tokyo, Japan) (29, 30, 31). To generate a retroviral construct expressing a mutant Rβ1 chain that lacked the cytoplasmic tail, a PCR fragment was generated using a forward primer incorporating the unique upstream BlpI site at bp 1473 (5′-CGTCACAGCTGAGCACCTGC-3′) and reverse primer incorporating a stop codon and NotI site immediately after bp 1776 (5′-TACGTAGCGGCCGCATACTTAATTAAGGCCAATGTATCCGAGACTGC-3′). Ligation of the BlpI/NotI-digested PCR fragment to the BlpI/NotI-digested pMX-mIL-12Rβ1-IRES-GFP generated pMX-ΔCyto-IRES-GFP that encoded for a Rβ1 protein truncated one amino acid distal to the transmembrane domain (i.e., after aa 592). All manipulations were verified by automated sequencing of sense and antisense strands (32). Retroviral infection of NIH3T3 and BMM was performed according to established protocols (26, 33, 34). Infectious retrovirus was generated using the Phoenix-ECO packaging cell line that was kindly provided by Dr. G. Nolan (Stanford University School of Medicine, Stanford, CA). Cells were incubated for 1 h with DMEM plus 10% FCS and chloroquine (25 μM) and then treated with DNA/CaCl2/HEPES-buffered saline solution (20% v/v) for 10 h followed by replacement with fresh growth medium. Medium containing retrovirus was collected 48 and 72 h following initial transfection, filtered, and used for infection of NIH3T3 or BMM cells. To infect NIH3T3 and BMM, retroviral supernatant containing polybrene (5 μg/ml) was incubated with cells for 24 or 48 h, respectively. The BMM cells underwent positive selection for GFP expression using a FACSVantage SE flow cytometer interfaced with CellQuest software (BD Biosciences) to obtain a purified population of BMM expressing GFP and the transgene (typically >90%). Immunofluorescent labeling of Rβ1 on cells was performed as described previously (32). Cells were fixed with 2% paraformaldehyde (10 min) and sequentially incubated with 2% fish gel, mouse anti-mouse IL-12Rβ1 (clone 114, 10 μg/ml; BD Biosciences), or mouse IgG, biotinylated goat anti-mouse IgG (2.5 μg/ml, BD Biosciences), and streptavidin conjugated to Texas Red (6.66 μg/ml; Vector Laboratories, Burlingame, CA) for 1 h at 27°C. To label Rβ1 on BMM, cells were incubated with rat anti-mouse CD16/CD32 FC Block (clone 2.4G2, 25 μg/ml; BD Biosciences) for 1 h at 27°C before addition of mouse anti-mouse IL-12Rβ1. To detect Rβ1 by flow cytometric analysis, cells were sequentially incubated with mouse anti-mouse IL-12Rβ1 (clone 114, 4 μg/ml) or mouse IgG, biotinylated goat anti-mouse IgG (2.5 μg/ml; BD Biosciences), and streptavidin conjugated to PE (0.15 μg/ml; BD Biosciences) for 30 min at 4°C and analyzed using a FACSCalibur flow cytometer interfaced with CellQuest software. To visualize intracellular F-actin, cells were fixed with 3.7% paraformaldehyde (10 min), permeabilized with 0.1% Triton X-100 (5 min), and then incubated with Alexa Fluor 568 phalloidin (2.5 U/ml,Molecular Probes, Rockville, MD) for 30 min, all at 27°C. Coverslips were mounted with Vectastain containing 4′,6′-diamidino-2-phenylindole (Vector Laboratories) and cells were imaged with an epifluorescent microscope (Olympus model BX-51; Olympus, Melville, NY) interfaced to a digital photomicrographic system (Optronix charge-coupled device camera (Optronix Laboratories, Orlando, FL, and MagnaFire version 2 software, Olympus, Melville, NY). To assess p80-dependent F-actin reorganization in NIH3T3 fibroblasts, cells were incubated in serum-free medium for 16 h and treated without or with p80 (10−9 M) or EGF (10−8 M) for 10 min before fixation. Percent activation was determined by counting the proportion of 100 cells with central clearing of F-actin, and final values represented mean of three independent experiments. As previously described, mice underwent anesthesia and intranasal inoculation with SeV (Fushimi strain, ATCC no. VR-105, American Type Culture Collection) or UV-inactivated SeV at the indicated dose (egg infectious dose 50%) diluted in 30 μl of PBS (1, 2). Daily inspection and weight loss were monitored and, on the indicated postinoculation day, BAL or lung harvest was performed. To procure mouse lungs, the right ventricle was flushed with 3 ml of PBS, the trachea was cannulated, lungs were fixed with 10% buffered Formalin at 25 cm water pressure, dehydrated in ethanol, embedded in paraffin, and cut into 5-μm-thick sections. To identify SeV protein, tissue sections were sequentially incubated with nonimmune rabbit serum, rat anti-SeV pAb (1/750 v/v; BioReliance, Rockville, MD) for 18 h at 4°C, biotinylated rabbit anti-rat IgG (Vector Laboratories), streptavidin-conjugated alkaline phosphatase complex, and red chromogen as described previously (1, 2). Tissue sections were counterstained with hematoxylin, dehydrated in graded ethanol, mounted for bright-field microscopy, and imaged as above. SeV protein in whole lung tissue lysate was measured by Western blot analysis. Whole cell protein extracts were prepared by sonication using lysis buffer containing 50 mM Tris (pH 8.0), 150 mM NaCl, 0.5% Nonidet P-40, 1 mM EDTA, 1 mM PMSF, 1 mM sodium orthovanadate, 10 mM sodium fluoride, 2 mM sodium pyrophosphate, 10 μg/ml leupeptin, and 10 μg/ml aprotinin. Whole cell protein was subjected to SDS-PAGE using a 7% polyacrylamide gel and transferred to a polyvinylidene fluoride membrane. The membrane was immunolabeled with rat anti-Sendai pAb (1/500 v/v; BioReliance) for 1 h at 27°C, followed by incubation with goat anti-rat HRP (1/5000 v/v; Roche Diagnostic, Indianapolis, IN) for 1 h at 27°C, and detection with ECL (Amersham Life Science, Arlington Heights, IL). To document SeV specificity and equal protein loading, the membrane was stripped and immunoblotted using mouse anti-chicken actin Ab (0.4 μg/ml, clone C4; Chemicon International, Temecula, CA) for 1 h at 27 °C, followed by incubation with goat anti-mouse IgG1 HRP (1/5000 v/v; Roche Diagnostic) for 1 h at 27°C, and detection as above. Total murine IL-12 p40 (p80 plus p40) in the BAL was measured in duplicate using an ELISA kit (R&D Systems) with a sensitivity of 4 pg/ml and 20% cross-reactivity for IL-12. Values for macrophage accumulation in airway and chemotaxis assays were analyzed for statistical significance using a one-way ANOVA for a factorial experimental design. The multicomparison significance level for the one-factor ANOVA was 0.05. When significance was achieved by one-way analysis, post hoc comparison using Scheffé’s procedure was performed to identify significant differences between specific groups. The significance level for the post hoc analysis corresponded to a value of 0.05. Scheffé’s procedure was chosen because it tests for significant differences between all pairs of conditions and it is more conservative than the Tukey’s, Newman-Keuls, Dunnett’s, and least-significant difference procedures (35). Mortality comparison between wild-type and Rβ1−/− mice was analyzed using the Wilcoxon rank sum test and all other strain comparisons utilized an independent group’s t test (or Student’s t test). The significance level for the Wilcoxon rank sum test and the t test corresponded to a two-tailed value of 0.05. We have previously demonstrated enhanced p80 expression in the airway of humans with asthmatic inflammation and during murine respiratory virus-induced inflammation. In both conditions, we observed a correlation between increased p80 concentrations and macrophage accumulation in the airways (1). To explore this correlation, we studied the ability of IL-12 family members to act as macrophage chemoattractants. Intratracheal administration of p80, but not IL-12 or p40, selectively enhanced airway macrophage accumulation (Fig. 1⇓A). To examine the ability of IL-12 family members to act as macrophage chemoattractants in vitro, we isolated peritoneal macrophages from C57BL/6J mice. Analysis using a modified Boyden chamber revealed p80, but not IL-12 or p40, generated a concentration-dependent increase in macrophage movement. The p80-dependent movement was quantitatively identical to optimal concentrations of the known macrophage chemoattractants JE (mouse homologue to human monocyte chemoattractant protein-1) and fMLP (Fig. 1⇓B). At high p80 concentrations, there was a decrease in cell movement, consistent with the bell-shaped response previously observed in chemoattractant studies with multiple cell types (including macrophages) (28, 36, 37, 38, 39, 40, 41). An identical p80 response was obtained using BALB/cJ mouse macrophages, indicating strain independence (10−9 M chemotactic activity, 11.9 ± 0.4, Fig. 2⇓C). Furthermore, checkerboard analysis (i.e., correlating increased cell movement toward a chemotactic gradient) revealed this p80-dependent movement represented chemotaxis rather than chemokinesis (Fig. 1⇓C). We did not observe p80-dependent augmentation of oxidative burst or phagocytosis (data not shown), suggesting p80 treatment initiates a selective chemotactic signal in these cells. p80 functions as a macrophage chemoattractant. A, C57BL/6J mice underwent intratracheal (IT) administration of vehicle (PBS), IL-12, p80, or p40 (40 μg/kg). At 18 h after treatment, BAL fluid was analyzed for total and macrophage cell number. Values represent mean ± SD (n = 3–4), and a significant difference from the PBS cohort (by ANOVA) is indicated (∗). B, C57BL/6J mice underwent i.p. injection with thioglycolate and at day 5 harvested macrophages (25,000) were placed in the upper compartment of a modified Boyden chamber apparatus. Medium, increasing concentrations of IL-12 family members (10−13–10−8 M), JE (10−8 M), or fMLP (10−9 M) were placed in the lower chamber and apparatus was incubated for 2 h at 37°C. Migrating cells were counted and values represent mean ± SEM for five high-power fields (magnification, × 400) (n = 9–12). A significant difference from medium (by ANOVA) is indicated (∗). C, C57BL/6J peritoneal macrophages were exposed to medium or increasing concentrations of p80 in upper and/or lower compartments of modified Boyden chamber. A significant difference from medium in upper and lower chamber (by ANOVA) is indicated (∗). p80-dependent macrophage chemotaxis requires Rβ1 expression. A, C57BL/6J peritoneal macrophages were exposed to medium or medium plus p80 that was pretreated without or with rat IgG control or rat anti-mouse IL-12 p40 IgG and protein G beads (to deplete the Ab-p80 complex). B, C57BL/6J peritoneal macrophages were pretreated without or with goat IgG control or goat anti-human Rβ1 IgG and exposed to medium or p80 (10−9 M). C, Peritoneal macrophages were obtained from the indicated strain and exposed to medium, increasing concentrations of p80 (10−13–10−8 M), or JE (10−8 M). A–C, Chemotactic activity was determined as in Fig. 1⇑ and a significant difference from p80 10−9 M (A and B) or from type BALB/cJ (C) by ANOVA is indicated (∗). To characterize proteins required for p80-dependent chemotaxis, medium was preincubated with anti-p40 blocking Ab. This treatment completely inhibited chemotaxis, indicating p80 generated this chemotaxis and not a by-product or contaminant of the cytokine purification process (Fig. 2⇑A). Since previous studies demonstrated p80 binds to Rβ1 (10, 17) and peritoneal elicited macrophages express Rβ1 as well as IL-12Rβ2 (Rβ2) (23), we examined the role of these proteins in mediating p80-dependent chemotaxis. Macrophages pretreated with anti-Rβ1 Ab or obtained from a Rβ1−/− mouse displayed blunted p80-dependent chemotaxis (Fig. 2⇑, B and C). In the case of Rβ1−/− macrophages, JE-dependent chemotaxis was unaltered, indicating loss of a specific p80-dependent response rather than a generalized defect in chemotaxis (Fig. 2⇑C). Furthermore, macrophages from Rβ2−/− and IL-12 p35−/− mice displayed equivalent p80-dependent chemotaxis relative to wild-type macrophages. These later observations indicated that p80-dependent chemotaxis is independent of Rβ2 expression and excluded a concurrent autocrine or paracrine IL-12 signal contributing to the p80-dependent chemotaxis (Fig. 2⇑C). Taken together, these observations indicated p80 functioned as macrophage chemoattractant and Rβ1 expression was required to mediate this response. To further define the role of Rβ1 in mediating p80-dependent chemotaxis, we performed retroviral gene transfer using a bicistronic expression construct containing an internal ribosomal entry site. This technique enabled simultaneous coexpression of the enhanced GFP and Rβ1 or a mutant receptor lacking the cytoplasmic tail (referred to as ΔCyto). Mock-transfected NIH3T3 cells and cells transfected with control vector (expressing GFP only) did not express Rβ1. NIH3T3 cells transfected with Rβ1 and ΔCyto vectors had similar surface Rβ1 expression (Fig. 3⇓, A and B). Importantly, expression of Rβ1, but not ΔCyto, was sufficient to mediate p80-dependent chemotaxis (Fig. 3⇓C). To further confirm the role of Rβ1 in mediating NIH3T3 cell p80-dependent chemotaxis, we examined p80-dependent alterations in F-actin reorganization, a process required for cell movement (42, 43). 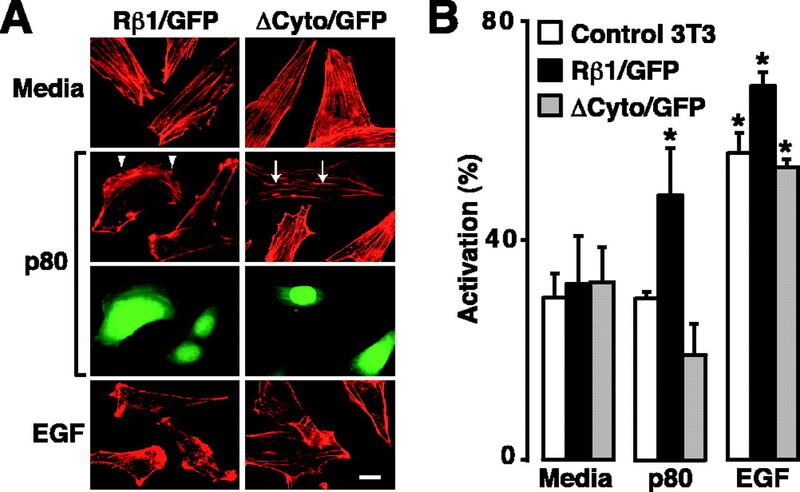 Expression of Rβ1, but not ΔCyto, enabled the cell to undergo p80-dependent F-actin reorganization (manifested by central clearing of the constitutive F-actin stress fibers and the formation of lamellipodia; Fig. 4⇓). EGF-dependent chemotaxis and F-actin reorganization were unaltered in all transfected cells, including the ΔCyto cells, indicating a specific defect in p80-dependent signaling rather than a generalized retroviral-induced defect in these cellular responses (Figs. 3⇓C and 4⇓). Thus, Rβ1, with an intact cytoplasmic tail, is necessary and sufficient to mediate p80-dependent chemotaxis and F-actin reorganization in NIH3T3 cells. Rβ1 is necessary and sufficient to mediate NIH3T3 cell p80-dependent chemotaxis and requires an intact cytoplasmic tail. A, NIH3T3 cells were uninfected (Control 3T3) or infected with retroviral supernatant containing empty vector (GFP), wild-type Rβ1 (Rβ1/GFP), or Rβ1 mutation lacking the cytoplasmic tail (ΔCyto/GFP). Cells were fixed with 2% paraformaldehyde, immunolabeled with mouse anti-mouse Rβ1 Ab, and detected with biotinylated goat anti-mouse IgG and streptavidin-conjugated Texas Red. Control mouse IgG, Texas Red only, and goat anti-mouse IgG plus Texas Red gave no signal above background (data not shown). Representative photomicrographs of merged images from identical fields with filters to detect Texas Red (red) and GFP (green) are shown (n = 3). Bar,10 μm. B, NIH3T3 cells treated as in A underwent FACS analysis for coexpression of cell surface Rβ1 (detected as above using a streptavidin-conjugated PE (SA-PE) reporter). Control mouse IgG, SA-PE only, and biotinylated goat anti-mouse IgG plus SA-PE gave no signal above background (data not shown). Representative dot blots with corresponding percentage of total cells are shown. C, NIH3T3 cells treated as in A were incubated in serum-free medium for 18 h and exposed to medium, p80 (10−9 M), or EGF (10−10 M) in a modified Boyden chamber for 6 h at 37°C. Chemotactic activity was determined as in Fig. 1⇑ and a significant difference between control NIH3T3 cells exposed to medium (by ANOVA) is indicated (∗). HPF, High-power field. Rβ1 is necessary and sufficient to mediate NIH3T3 cell p80-dependent F-actin reorganization and requires an intact cytoplasmic tail. A, NIH3T3 cells were infected with retroviral supernatant containing wild-type Rβ1 (Rβ1/GFP) or Rβ1 mutation lacking the cytoplasmic tail (ΔCyto/GFP). Cells were incubated in serum-free medium for 18 h and exposed to medium, p80 (10−9 M), or EGF (10−10 M) for 10 min, fixed with 3.7% paraformaldehyde, permeabilized with 0.1% Triton X-100, and incubated with Alexa Fluor 568-labeled phalloidin to identify intracellular F-actin. Representative photomicrographs of images from fields with filters to detect Alexa Fluor 568 (red, rows 1, 2, and 4) and GFP (green, row 3) are shown (n = 3). Arrowheads indicate lamellipodia and arrows indicate central stress fibers. Bar, 10 μm. B, Cells from A were analyzed for central clearing of stress fibers (activation percent). Values represent mean percent ± SD for 100 cells per condition from three independent experiments and a significant difference between control NIH3T3 cells exposed to medium (by ANOVA) is indicated (∗). To determine the role of Rβ1 in macrophage p80-dependent chemotaxis, we isolated primary culture BMM from Rβ1−/− mice. Gene transfer of Rβ1 and ΔCyto generated similar patterns of GFP and Rβ1 protein expression (Fig. 5⇓A). As seen in the NIH3T3 cells, expression of Rβ1, but not ΔCyto, rescued p80-dependent chemotaxis. All macrophage cells displayed equal JE-dependent chemotaxis, again indicating preserved chemotactic function following retroviral gene transfer and that deletion of the Rβ1 cytoplasmic tail resulted in a specific blockade of p80-dependent chemotaxis (Fig. 5⇓B). Thus, Rβ1 with an intact cytoplasmic tail is necessary and sufficient to mediate p80-dependent macrophage chemotaxis in vitro and suggested that Rβ1 may serve a similar function in vivo. Rβ1 is necessary and sufficient to mediate macrophage p80-dependent chemotaxis and requires an intact cytoplasmic tail. A, BALB/cJ Rβ1−/− bone marrow macrophages (Rβ1−/− BMM) were infected with retroviral supernatants containing empty vector (GFP), wild-type Rβ1 (Rβ1/GFP), or Rβ1 mutation lacking the cytoplasmic tail (ΔCyto/GFP). Cells were incubated with rat anti-mouse CD16/CD32 FC block and Rβ1 expression was determined as in Fig. 3⇑A. Mouse IgG, Texas Red only, and goat anti-mouse IgG plus Texas Red gave no signal above background (data not shown). Representative photomicrographs of merged images from identical fields with filters to detect GFP (green) and DNA (stained with 4′,6′-diamidino-2-phenylindole, blue) on the top row and Rβ1 expression (red) on the bottom row are shown (n = 3). Bar, 20 μm. B, Rβ1−/− BMM cells treated as in A and exposed to medium, p80 (10−9 M), or JE (10−8 M) in a modified Boyden chamber for 2 h at 37°C. Chemotactic activity was determined as in Fig. 1⇑ and a significant difference between Rβ1−/− BMM cells exposed to medium (by ANOVA) is indicated (∗). Having demonstrated Rβ1 is necessary and sufficient for p80-dependent macrophage chemotaxis in vitro, we next examined the role of Rβ1 in mediating inflammation and macrophage accumulation in vivo. We compared wild-type C57BL/6J and Rβ1−/− mice following respiratory infection with SeV. The Rβ1−/− mice were resistant to viral-dependent mortality despite equivalent viral burden (Fig. 6⇓, A–C). We also observed a trend toward enhanced production of the macrophage chemoattractant p80 in the BAL from the Rβ1−/− mice compared with wild-type animals (Fig. 6⇓D). Despite these elevated levels of p80 in the Rβ1−/− mice, BAL analysis revealed total and macrophage, but not neutrophil and lymphocyte, cell number was significantly decreased compared with wild type (Fig. 7⇓). 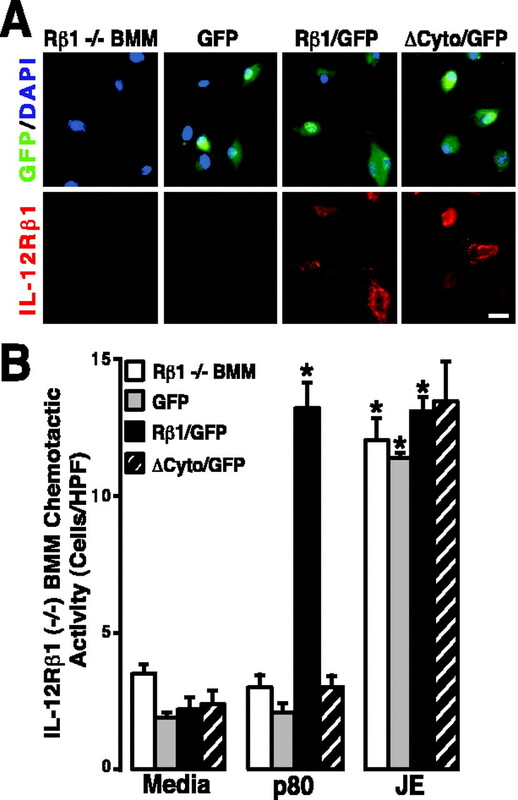 Collectively, these in vivo experiments demonstrate Rβ1 provides an inflammatory signal that is required for macrophage accumulation in the airway and further support the role of Rβ1 mediating p80-dependent macrophage chemotaxis in vivo. Rβ1 deficiency protects against lethal SeV infection despite similar viral burden and p80 production. A, Wild-type C57BL/6J (Rβ1+/+) or same strain Rβ1-deficient (Rβ1−/−) mice were inoculated with SeV 50,000 egg infectious dose 50% (SeV 50K) and monitored for survival by Kaplan-Meier analysis (n = 11 and 12 in each group). A significant increase in survival of Rβ1−/− mice (by Wilcoxon rank sum test) is indicated (∗). B, Rβ1+/+ and Rβ1−/− mice were inoculated with SeV 50K and day 3 and 6 lung sections were immunolabeled with rat anti-Sendai pAb and detected with biotinylated goat anti-rat IgG and streptavidin-conjugated alkaline phosphatase (red). Control rat IgG labeling and sections from normal and UV-inactivated SeV 50K-inoculated mice gave no signal above background (data not shown). Representative photomicrographs are shown (n = 3). Bar, 20 μm. C, Whole lung lysate from uninfected, UV-inactivated SeV 50K, and SeV 50K-inoculated Rβ1+/+ or Rβ1−/− mice at day 6 were subjected to Western blotting against anti-SeV and anti-actin Ab and detection by ECL. Bands corresponding to SeV phosphoprotein (P), hemagglutinin-neuraminidase (HN), nucleocapsid (N), matrix (M), and mouse actin proteins are indicated by arrows. D, BAL fluid from uninfected, UV-inactivated SeV 50K, SeV 5K, and SeV 50K-inoculated Rβ1+/+ or Rβ1−/− mice at day 3 and 6 were analyzed for total p40 levels by ELISA. Values represent mean ± SD of duplicate samples (n = 3–6). Western blot analysis of the day 6 BAL demonstrated the presence of both p80 and p40 (data not shown). Rβ1 deficiency results in decreased airway macrophage accumulation following SeV infection. A–D, Rβ1+/+ and Rβ1−/− mice were uninfected or inoculated with UV-inactivated SeV 50K, SeV 5K, and SeV 50K. At the indicated postinoculation day, BAL fluid was analyzed for total (A), macrophage (B), neutrophil (C), and lymphocyte (D) cell number. Values represent mean ± SD (n = 3–6). A significant difference between strains (by independent group t test) is indicated (∗). 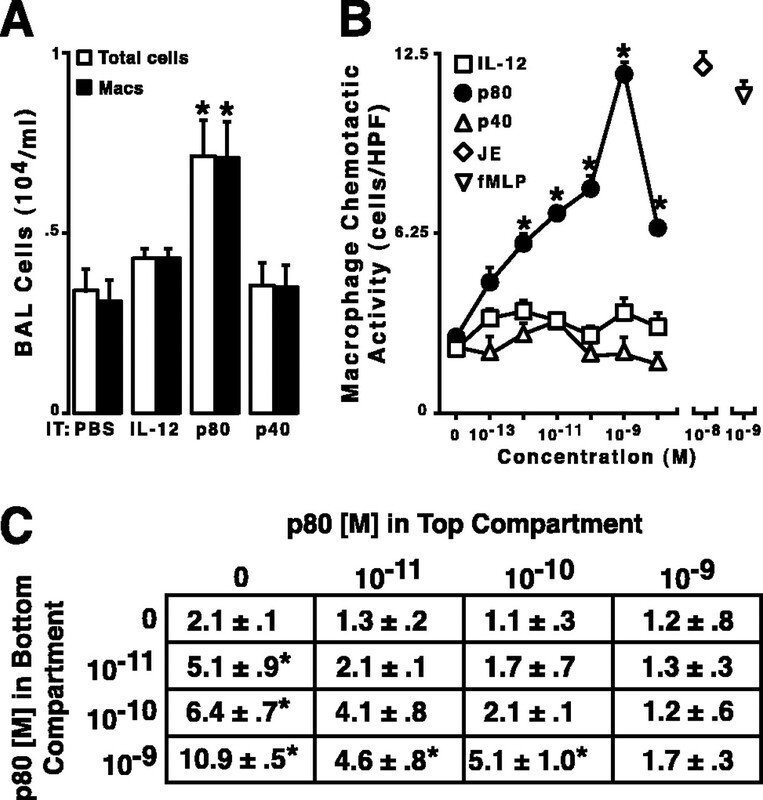 This report broadens the biologic properties of p80 to include macrophage chemotaxis, demonstrates that this cellular response is independent of IL-12, and identifies Rβ1 as necessary and sufficient to mediate p80-dependent chemotaxis. This macrophage chemotactic property is unique to p80 as neither IL-12 nor p40 resulted in accumulation of macrophages in vivo or cell movement in vitro. Finding that p80-dependent chemotaxis was unaltered in macrophages unable to secrete or respond to IL-12 demonstrated that this p80 response is completely independent of IL-12. In vitro studies indicated that expression of Rβ1, with an intact cytoplasmic tail, is necessary and sufficient to mediate p80-dependent chemotaxis and F-actin reorganization. Consistent with these in vitro findings, Rβ1−/− mice demonstrated decreased mortality, airway inflammation, and macrophage accumulation following SeV respiratory infection. Thus, we have described a cellular mechanism (i.e., p80-dependent macrophage chemotaxis) to explain the association between elevated p80 levels and enhanced macrophage accumulation observed in airway inflammatory conditions such as asthma and respiratory viral infection (1). The role for Rβ1 in mediating inflammation and immunity has been further elucidated by observations made in humans and mice that lack Rβ1 expression. Loss of Rβ1 expression results in distinct phenotypes that may be explained, at least in part, by a defect in p80-dependent macrophage chemotaxis. In this regard, humans that lack Rβ1 function are more susceptible to infection with the intracellular organisms Mycobacterium bovis bacille Calmette-Guérin, Mycobacterium avium, and Salmonella typhimurium (44, 45, 46, 47, 48, 49). Interestingly, the Rβ1-deficient human subjects with systemic bacille Calmette-Guérin infection demonstrated less organized granuloma formation (44), a phenotype that is also observed following alveolar macrophage depletion in Mycobacterium tuberculosis-infected mice (50). Abnormal macrophage recruitment may also contribute to increased susceptibility to S. typhimurium in Rβ1-deficient humans. In a mouse S. typhimurium infection model, enhancing macrophage accumulation with monocyte chemoattractant protein-1, a known chemoattractant, conferred resistance to infection (51), suggesting that a defect in Rβ1-mediated macrophage chemotaxis may account for the increased susceptibility to S. typhimurium in humans. Although Rβ1 deficiency appears to render the host more susceptible to these intracellular pathogens, mice deficient in Rβ1 are less susceptible to viral infection with SeV (Fig. 6⇑) and Coxsackie virus B3 (52). The myocarditis generated from Coxsackie virus B3 infection is associated with macrophage accumulation so the blunted myocardial inflammation in the Rβ1−/− mice likely reflects decreased macrophage accumulation (53, 54). In contrast to studies suggesting that p80 functioned as a competitive antagonist of IL-12 (11, 17, 55, 56), our current report demonstrates p80 provides its own immunomodulatory signal that is independent of IL-12. Mouse Con A-activated splenocytes display identical binding affinities for p80 and IL-12, and in these cells p80 competitively inhibited IL-12 binding and IL-12-dependent proliferation. Furthermore, p80 is able to inhibit IL-12-dependent IFN-γ production and NK cell activity in freshly isolated splenocytes. Despite functioning as a competitive antagonist of IL-12 in these lymphocyte model systems, exogenously administered p80 was unable to provide an agonistic signal (11). Currently, we have demonstrated exogenously administered p80 alone enhances certain macrophage processes such as chemotaxis, but fails to alter phagocytosis or oxidative burst. Although our results suggest p80 directly generates chemotaxis, it is possible p80 could generate chemotaxis by induction of an alternative chemoattractant or by causing secretion of a preformed secondary chemoattractant. A number of observations make these possibilities unlikely. First, p80-dependent macrophage chemotaxis occurs in 2 h, a relatively short interval for transcription, translation, and secretion of an alternative chemoattractant. Second, secretion of a preformed secondary chemoattractant would not generate a gradient in the lower compartment of the Boyden chamber and therefore result in chemokinesis rather than chemotaxis. Third, p80-dependent chemotaxis also occurs in NIH3T3 fibroblasts, cells that have fewer pre-existing secretory granules than macrophages, and p80-dependent F-actin reorganization in the fibroblast occurs in 10 min, clearly an insufficient amount of time for new protein synthesis and secretion. In agreement with our observations, another report has demonstrated that p80 signals to enhance macrophage movement and demonstrated that in vivo p80 overexpression is associated with enhanced tissue macrophage accumulation (1, 18). Collectively, our results demonstrate p80, but not IL-12 or p40, provides a specific immunomodulatory signal for macrophage chemotaxis that is independent of IL-12. We have also defined a novel role for Rβ1 in mediating the p80-dependent chemotactic signal. Previous data indicated expression of Rβ1 in the mouse pro-B cell line BA/F3 is necessary and sufficient to generate a p80 binding affinity that is equivalent to Con A splenocytes, LPS-activated B cells, and Staphylococcus aureus cell-activated B cells (17). However, this study failed to identify an agonist function for p80 that was mediated through Rβ1. We have used gene transfer experiments with Rβ1 and the ΔCyto mutant to demonstrate that the cytoplasmic tail of Rβ1 is necessary and sufficient to mediate p80-dependent chemotaxis. Although Rβ1 is necessary and sufficient to mediate these binding affinities and the chemotactic response, neither the previous data nor ours can definitively exclude the requirement of an additional receptor chain in p80 binding and signaling. This potential receptor chain would be required to possess a low p80 binding affinity, be functional on various mouse cell lines (NIH3T3 fibroblasts, BV-2 glial cells, and Ba/F3 pro B cells), and primary culture mouse cells (peritoneal macrophages, splenocytes, B cells, and BMM) to be consistent with our data (Figs. 1–5⇑⇑⇑⇑⇑) and previously published reports (17, 57). In addition, this potential receptor would also need to display species cross-reactivity with the monkey as we have demonstrated Rβ1, with an intact cytoplasmic tail, is necessary and sufficient to mediate p80-dependent chemotaxis in COS-7 cells (T.D.R. and M.J.W., unpublished observations). Assuming p80 initiates a single intracellular chemotactic cascade, our results demonstrated unaltered p80-dependent chemotaxis in macrophages from Rβ2−/− mice, thus excluding a role for this particular receptor in mediating the chemotactic signal. Given that mouse Rβ1 exists as disulfide-linked dimers/oligomers in transfected COS-7 and Ba/F3 cells (58, 59), p80 signaling may be initiated by further homomultimerization of Rβ1 dimers/oligomers or by the formation of a receptor-ligand complex that recruits an additional receptor chain. Regardless of the Rβ1 signaling mechanism, our current experiments indicate Rβ1 is necessary and sufficient to mediate p80-dependent chemotaxis. The precise intracellular signaling cascade culminating in these p80-dependent processes are unclear; however, others have demonstrated that phosphoinositide 3-kinase (PI3K) is a critical intracellular mediator of chemotaxis and F-actin reorganization (60, 61). In that context, we have used the PI3K inhibitors wortmannin and LY294002 to inhibit p80-dependent chemotaxis (Q.Y, and M.J.W., unpublished observations). Although Rβ1 does contain an intracellular tyrosine residue, p80-dependent tyrosine phosphorylation has not been previously described and the amino acids that surround this tyrosine do not conform to a canonical or alternative recognition motifs for PI3K family members (62, 63). Therefore, we speculate p80-dependent activation of PI3K will likely be a consequence of a downstream cascade that is mediated through, at least one additional intracellular signaling protein. Rβ1 is necessary and sufficient to mediate p80-dependent chemotaxis, as well as IL-12 and IL-23 signaling (12, 55, 58, 64). Accordingly, it is feasible that loss of signaling from these cytokines may have accounted for our observed phenotypes. For example, the absence of IL-12 signaling may have resulted in a less severe inflammatory response because of decreased T lymphocyte activation and IFN-γ production. Although we cannot exclude a concurrent IL-12 or IL-23 signal in mediating the Rβ1−/− phenotypes, we believe this is unlikely for the following reasons. Mice deficient in IL-12 and IL-23 (by the disruption of the IL-12 p40 gene) display an unaltered inflammatory response rather than a blunted response as seen in Rβ1−/− mice. Moreover, mice deficient in IL-12 (by the disruption of IL-12 p35 gene) display an enhanced SeV-dependent inflammatory response rather than a blunted response (1). Additional studies using techniques that selectively block IL-12 and IL-23 will further determine whether these cytokines contribute to the observed phenotypes. In the SeV infection model, total macrophage accumulation in the lung following viral infection correlates with severity of the inflammatory response and subsequent viral-dependent mortality. For example, IL-12 p35-deficient mice display augmented macrophage accumulation and increased mortality (1), whereas the Rβ1-deficient mice display blunted macrophage accumulation and decreased mortality. We propose that the macrophage can provide numerous proinflammatory stimuli that can amplify the inflammatory response and overwhelm the host. These stimuli are involved in various aspects of the inflammatory response and include the surface expression of MHC class II and the secretion of TNF-α, IL-1, IL-6, NO, and oxidative metabolites. Further studies are underway to determine whether SeV-driven macrophage accumulation correlates with mortality in additional mouse strains and whether p80-dependent macrophage accumulation correlates with the severity of other inflammatory stimuli. Taken together, the data support the concept that the macrophage plays a central role in mediating the severity of the viral inflammatory response. In summary, our data describe p80-dependent macrophage chemotaxis that is independent of IL-12 and mediated through the cytoplasmic tail of Rβ1. Extending these observations to an in vivo airway inflammatory model indicated Rβ1 mediates macrophage accumulation in the lung following respiratory viral infection. Accordingly, strategies aimed to inhibit Rβ1-mediated p80-dependent macrophage chemotaxis may provide a therapeutic tool to treat inflammatory conditions, such as asthma and respiratory viral infection, that are associated with elevated levels of p80 and inappropriate macrophage accumulation. We gratefully thank Hong Chen and Loryn Rikimaru for their technical assistance and Drs. Kenneth Murphy, Robert Senior, and Robert Arch for helpful discussion. Additionally, we thank Drs. Teitelbaum, Nolan, and Kitamura for the use of their reagents. ↵1 This work was supported by National Institutes of Health Grants T32 HL07317 (to T.D.R) and K08 HL03828 and R01 HL/AI 71947 (to M.J.W.). ↵3 Abbreviations used in this paper: F-actin, filamentous actin; SeV, Sendai virus; BAL, bronchoalveolar lavage; BMM, bone marrow-derived macrophage; EGF, epidermal growth factor; GFP, green fluorescent protein; PI3K, phosphoinositide 3-kinase; SA-PE, streptavidin-PE; SeV 50K/5K, SeV 50,000/5,000 egg infectious dose 50%. Walter, M. J., N. Kajiwara, P. Karanja, M. Castro, M. J. Holtzman. 2001. IL-12 p40 production by barrier epithelial cells during airway inflammation. J. Exp. Med. 193:339. Walter, M. J., J. D. Morton, N. Kajiwara, E. Agapov, M. J. Holtzman. 2002. Viral induction of a chronic asthma phenotype and genetic segregation from the acute response. J. Clin. Invest. 110:165. Holtzman, M. J., J. D. Morton, L. P. Shornick, J. W. Tyner, M. P. O’Sullivan, A. Antao, M. Lo, M. Castro, M. J. Walter. 2002. Immunity, inflammation, and remodeling in the airway epithelial barrier: epithelial-viral-allergic paradigm. Physiol. Rev. 82:19. Holtzman, M. J., M. Castro, D. C. Look, M. O’Sullivan, M. J. Walter. 2000. Regulation of epithelial-leukocyte interactions and epithelial immune-response genes. W. Busse, and S. Holgate, eds. In Asthma and Rhinitis Vol. 1:784. Blackwell, Cambridge, MA. Chung, C. Y., S. Funamoto, R. A. Firtel. 2001. Signaling pathways controlling cell polarity and chemotaxis. Trends Biochem. Sci. 26:557. Condeelis, J.. 2001. How is actin polymerization nucleated in vivo?. Trends Cell. Biol. 11:288. Small, J. V., T. Stradal, E. Vignal, K. Rottner. 2002. The lamellipodium: where motility begins. Trends Cell. Biol. 12:112. Stern, A. S., F. J. Podlaski, J. D. Hulmes, Y. E. Pan, P. M. Quinn, A. G. Wolitzky, P. C. Familletti, C. L. Stremlo, T. Truit, R. Chizzonite, M. K. Gately. 1990. Purification to homogeneity and partial characterization of cytotoxic lymphocyte maturation factor from human B-lymphoblastoid cells. Proc. Natl. Acad. Sci. USA 87:6808. Kobayashi, M., L. Fitz, M. Ryan, R. M. Hewick, S. C. Clark, S. Chan, R. Loudon, F. Sherman, B. Perussia, G. Trinchieri. 1989. Identification and purification of natural killer cell stimulatory factor (NKSF), a cytokine with multiple biologic effects on human lymphocytes. J. Exp. Med. 170:827. Ling, P., M. K. Gately, U. Gubler, A. S. Stern, P. Lin, K. Hollfelder, C. Su, Y. Pan, J. Hakimi. 1995. Human IL-12 p40 homodimer binds to the IL-12 receptor but does not mediate biologic activity. J. Immunol. 154:116. Gillessen, S., D. Carvajal, F. J. Podlaski, D. L. Stremlo, P. C. Familletti, U. Gubler, D. H. Presky, A. S. Stern, M. Gately. 1995. Mouse interleukin-12 (IL-12) p40 homodimer: a potent IL-12 antagonist. Eur. J. Immunol. 25:200. Oppmann, B., R. Lesley, B. Blom, J. C. Timans, Y. Xu, B. Hunte, F. Vega, N. Yu, J. Wang, K. Singh, et al 2000. Novel p19 protein engages IL-12p40 to form a cytokine, IL-23, with biologic activities similar as well as distinct from IL-12. Immunity 13:715. Devergne, O., M. Hummel, H. Koeppen, M. Le Beau, E. Nathanson, E. Kieff, M. Birkenbach. 1996. A novel interleukin-12 p40 related protein induced by latent Epstein-Barr virus infection in B lymphocytes. J. Virol. 70:1143. Devergne, O., M. Birkenbach, E. Kieff. 1997. Epstein-Barr virus-induced gene 3 and the p35 subunit of interleukin 12 form a novel heterodimeric hematopoietin. Proc. Natl. Acad. Sci. USA 94:12041. Heinzel, F. P., A. M. Hujer, F. N. Ahmed, R. M. Rerko. 1997. In vivo production and function of IL-12 p40 homodimers. J. Immunol. 158:4381. Wang, X., V. L. Wilkinson, F. J. Podlaski, C. Wu, A. S. Stern, D. H. Presky, J. Magram. 1999. Characterization of mouse interleukin-12 p40 homodimer binding to the interleukin-12 receptor subunits. Eur. J. Immunol. 29:2007. Ha, S. J., C. H. Lee, S. B. Lee, C. M. Kim, K. L. Jang, H. S. Shin, Y. C. Sung. 1999. A novel function of IL-12p40 as a chemotactic molecule for macrophages. J. Immunol. 163:2902. Kopp, T., D. Kieffer, A. Rot, S. Strommer, G. Stingl, T. S. Kupper. 2001. Inflammatory skin disease in K14/p40 transgenic mice: evidence for interleukin-12-like activities of p40. J. Invest. Dermatol. 117:618. Yoshimoto, T., C. Wang, T. Yoneto, S. Waki, S. Sunaga, Y. Komagata, M. Mitsuyama, J. Miyazaki, H. Nariuchi. 1998. Reduced T helper 1 responses in IL-12 p40 transgenic mice. J. Immunol. 160:588. Chen, L., D. Chen, E. Block, M. O’Donnell, D. W. Kufe, S. K. Clinton. 1997. Eradication of murine bladder carcinoma by intratumor injection of a bicistronic adenoviral vector carrying cDNAs for the IL-12 heterodimer and its inhibitor by the IL-12 p40 subunit homodimer. J. Immunol. 159:351. Holscher, C., R. A. Atkinson, B. Arendse, N. Brown, E. Myburgh, G. Alber, F. Brombacher. 2001. A protective and agonistic function of IL-12p40 in mycobacterial infection. J. Immunol. 167:6957. Grohmann, U., M. L. Belladonna, C. Vacca, R. Bianchi, F. Fallarino, C. Orabona, M. C. Fioretti, P. Puccetti. 2001. Positive regulatory role of IL-12 in macrophages and modulation by IFN-γ. J. Immunol. 167:221. Abu-Amer, Y., F. P. Ross, K. P. McHugh, A. Livolsi, J. Peyron, S. L. Teitelbaum. 1998. Tumor necrosis factor-α activation of nuclear transcription factor-κB in marrow macrophages is mediated by c-Src tyrosine phosphorylation of IκBα. J. Biol. Chem. 45:29417. Lam, J., S. Takeshita, J. E. Barker, O. Kanagawa, F. P. Ross, S. L. Teitelbaum. 2000. TNF-α induces osteoclastogenesis by direct stimulation of macrophages exposed to permissive levels of RANK ligand. J. Clin. Invest. 106:1481. Feng, X., D. V. Novack, R. Faccio, D. S. Ory, K. Aya, M. I. Boyer, K. P. McHugh, F. P. Ross, S. L. Teitelbaum. 2001. A Glanzmann’s mutation in β3 integrin specifically impairs osteoclast function. J. Clin. Invest. 107:1137. Mattner, F., S. Fischer, S. Guckes, S. Jin, H. Kaulen, E. Schmitt, E. Rude, G. Tieno. 1993. The interleukin-12 subunit p40 specifically inhibits effects of the interleukin-12 heterodimer. Eur. J. Immunol. 23:2202. Yule, K. A., S. R. White. 1999. Migration of 3T3 and lung fibroblasts in response to calcitonin gene-related peptide and bombesin. Exp. Lung. Res. 25:261. Nosaka, T., T. Kawashima, K. Misawa, K. Ikuta, A. L. Mui, T. Kitamura. 1999. STAT5 as a molecular regulator of proliferation, differentiation and apoptosis in hematopoietic cells. EMBO J. 18:4754. Kawakami, Y., T. Miura, R. Bissonnette, D. Hata, W. N. Khan, T. Kitamura, M. Maeda-Yamamoto, S. E. Hartman, L. Yao, F. W. Alt, T. Kawakami. 1997. Bruton’s tyrosine kinase regulates apoptosis and JNK/SAPK kinase activity. Proc. Natl. Acad. Sci. USA 94:3938. Onishi, M., T. Nosaka, K. Misawa, A. L. Mui, D. Gorman, M. McMahon, A. Miyajima, T. Kitamura. 1998. Identification and characterization of a constitutively active STAT5 mutant that promotes cell proliferation. Mol. Cell. Biol. 18:3871. Walter, M. J., D. C. Look, R. M. Tidwell, W. T. Roswit, M. J. Holtzman. 1997. Targeted inhibition of interferon-γ-dependent ICAM-1 expression using dominant-negative Stat1. J. Biol. Chem. 272:28582. Pear, W. S., G. P. Nolan, M. L. Scott, D. Baltimore. 1993. Production of high-titer helper-free retroviruses by transient transfection. Proc. Natl. Acad. Sci. USA 90:8392. Kitamura, T., M. Onishi, S. Kinoshita, A. Shibuya, A. Miyajima, G. P. Nolan. 1995. Efficient screening of retroviral cDNA expression libraries. Proc. Natl. Acad. Sci. USA 92:9146. Dawson-Saunders, B., R. G. Trapp. 1994. Comparing three or more means. Basic and Clinical Biostatistics 134.-136. Appleton and Lange, East Norwalk, CT.
Aksamit, R. R., W. Falk, E. J. Leonard. 1981. Chemotaxis by mouse macrophage cell lines. J. Immunol. 126:2194. Heit, B., S. Tavener, E. Raharjo, P. Kubes. 2002. An intracellular signaling hierarchy determines direction of migration in opposing chemotactic gradients. J. Cell Biol. 159:91. Senior, R. M., G. L. Griffin, H. D. Perez, R. O. Webster. 1988. Human C5a and C5a des Arg exhibit chemotactic activity for fibroblasts. J. Immunol. 141:3570. Banda, M. J., A. G. Rice, G. L. Griffin, R. M. Senior. 1988. α1-proteinase inhibitor is a neutrophil chemoattractant after proteolytic inactivation by macrophage elastase. J. Biol. Chem. 263:4481. Matsui, T., J. H. Pierce, T. P. Fleming, J. S. Greenberger, W. J. LaRochelle, M. Ruggiero, S. A. Aaronson. 1989. Independent expression of human alpha or beta platelet-derived growth factor receptor cDNAs in a naive hematopoietic cell leads to functional coupling with mitogenic and chemotactic signaling pathways. Proc. Natl. Acad. Sci. USA 86:8314. Eriksson, A., A. Siegbahn, B. Westermark, C. H. Heldin, L. Claesson-Welsh. 1992. PDGF α- and β-receptors activate unique and common signal transduction pathways. EMBO J. 11:543. Nobes, C. D., A. Hall. 1999. Rho GTPases control polarity, protrusion, and adhesion during cell movement. J. Cell Biol. 144:1235. Jimenez, C., R. A. Portela, M. Mellado, J. M. Rodriguez-Frade, J. Collard, A. Serrano, A. C. Martinez, J. Avila, A. C. Carrera. 2000. Role of the PI3K regulatory subunit in the control of actin organization and cell migration. J. Cell Biol. 151:249. Altare, F., A. Durandy, D. Lammas, J. Emile, S. Lamhamedi, F. Le Deist, P. Drysdale, E. Jouanguy, R. Doffinger, F. Bernaudin, et al 1998. Impairment of mycobacterial immunity in human interleukin-12 receptor deficiency. Science 280:1432.
de Jong, R. D., F. Altare, I. Haagen, D. G. Elferink, T. de Boer, P. J. C. van Breda Vriesman, P. J. Kabel, J. M. T. Draaisma, J. T. van Dissel, F. P. Kroon, et al 1998. Severe mycobacterial and Salmonella infections in interleukin-12 receptor deficient patients. Science 280:1435. Fieschi, C., S. Dupuis, E. Catherinot, J. Feinberg, J. Bustamante, A. Breiman, F. Altare, R. Baretto, F. Le Deist, S. Kayal, et al 2003. Low penetrance, broad resistance, and favorable outcome of interleukin 12 receptor beta1 deficiency: medical and immunological implications. J. Exp. Med. 197:527. Elloumi-Zghal, H., M. R. Barbouche, J. Chemli, M. Bejaoui, A. Harbi, N. Snoussi, S. Abdelhak, K. Dellagi. 2002. Clinical and genetic heterogeneity of inherited autosomal recessive susceptibility to disseminated Mycobacterium bovis bacille Calmette-Guérin infection. J. Infect. Dis. 185:1468. Sakai, T., M. Matsuoka, M. Aoki, K. Nosaka, H. Mitsuya. 2001. Missense mutation of the interleukin-12 receptor β1 chain-encoding gene is associated with impaired immunity against Mycobacterium avium complex infection. Blood 97:2688. Aksu, G., C. Tirpan, C. Cavusoglu, S. Soydan, F. Altare, J. L. Casanova, N. Kutukculer. 2001. Mycobacterium fortuitum-chelonae complex infection in a child with complete interleukin-12 receptor β1 deficiency. Pediatr. Infect. Dis. J. 20:551. Leemans, J. C., N. P. Juffermans, S. Florquin, N. van Rooijen, M. J. Vervoordeldonk, A. Verbon, S. J. van Deventer, T. van der Poll. 2001. Depletion of alveolar macrophages exerts protective effects in pulmonary tuberculosis in mice. J. Immunol. 166:4604. Nakano, Y., T. Kasahara, N. Mukaida, Y. C. Ko, M. Nakano, K. Matsushima. 1994. Protection against lethal bacterial infection in mice by monocyte-chemotactic and -activating factor. Infect. Immun. 62:377. Fairweather, D., S. Yusung, S. Frisancho, M. Barrett, S. Gatewood, R. Steele, N. R. Rose. 2003. IL-12 Receptor β1 and Toll-like receptor 4 increase IL-1β- and IL-18-associated myocarditis and Coxsackievirus replication. J. Immunol. 170:4731. Lane, J. R., D. A. Neumann, A. Lafond-Walker, A. Herskowitz, N. R. Rose. 1991. LPS promotes CB3-induced myocarditis in resistant B10.A mice. Cell. Immunol. 136:219. Lane, J. R., D. A. Neumann, A. Lafond-Walker, A. Herskowitz, N. R. Rose. 1992. Interleukin 1 or tumor necrosis factor can promote Coxsackie B3-induced myocarditis in resistant B10.A mice. J. Exp. Med. 175:1123. Wu, C., J. Ferrante, M. K. Gately, J. Magram. 1997. Characterization of IL-12 receptor β1 chain (IL-12Rβ1)-deficient mice: IL-12Rβ1 is an essential component of the functional mouse IL-12 receptor. J. Immunol. 159:1658. Wu, C., X. Wang, M. Gadina, J. J. O’shea, D. H. Presky, J. Magram. 2000. IL-12 receptor β2 (IL-12Rβ2)-Deficient mice are defective in IL-12-mediated signaling despite the presence of high affinity IL-12 binding sites. J. Immunol. 165:6221. Pahan, K., F. G. Sheikh, X. Liu, S. Hilger, M. McKinney, T. M. Petro. 2001. Induction of nitric-oxide synthase and activation of NF-κB by interleukin-12 p40 in microglial cells. J. Biol. Chem. 276:7899. Chua, A. O., V. L. Wilkinson, D. H. Presky, U. Gubler. 1995. Cloning and characterization of a mouse IL-12 receptor-β component. J. Immunol. 155:4286. Presky, D. H., H. Yang, L. J. Minetti, A. O. Chua, N. Nabavi, C. Wu, M. K. Gately, U. Gubler. 1996. A functional interleukin 12 receptor complex is composed of two β-type cytokine receptor subunits. Proc. Natl. Acad. Sci. USA 93:14002. Curnock, A. P., M. K. Logan, S. G. Ward. 2002. Chemokine signaling: pivoting around multiple phosphoinositide 3-kinases. Immunology 105:125. Wymann, M. P., S. Sozzani, F. Altruda, A. Mantovani, E. Hirsch. 2000. Lipids on the move: phosphoinositide 3-kinases in leukocyte function. Trends Immunol. Today 21:260. Ponzetto, C., A. Bardelli, F. Maina, P. Longati, G. Panayotou, R. Dhand, M. D. Waterfield, P. M. Comoglio. 1993. A novel recognition motif for phosphatidylinositol 3-kinase binding mediates its association with the hepatocyte growth factor/scatter factor receptor. Mol. Cell. Biol. 13:4600. Carpenter, C. L., K. R. Auger, M. Chanudhuri, M. Yoakim, B. Schaffhausen, S. Shoelson, L. C. Cantley. 1993. Phosphoinositide 3-kinase is activated by phosphopeptides that bind to the SH2 domains of the 85-kDa subunit. J. Biol. Chem. 268:9478. Parham, C., M. Chirica, J. Timans, E. Vaisberg, M. Travis, J. Cheung, S. Pflanz, R. Zhang, K. P. Singh, F. Vega, et al 2002. A receptor for the heterodimeric cytokine IL-23 is composed of IL-12Rβ1 and a novel cytokine receptor subunit, IL-23R. J. Immunol. 168:5699.